Available in 3 variants dimension. External dimension cm31x31, internal dimension cm25x25, height cm70, base cm24x24, weight 3,4 kg. External dimension cm38x38, internal dimension cm34x34, height cm85, base cm28x28, weight 6,4 kg. External dimension cm45x45, internal dimension cm40x40, height cm100, base cm34x34, weight 8,4 kg. More than just a vase, the cachepot Genesis square with light, is a genuine complement of furniture. 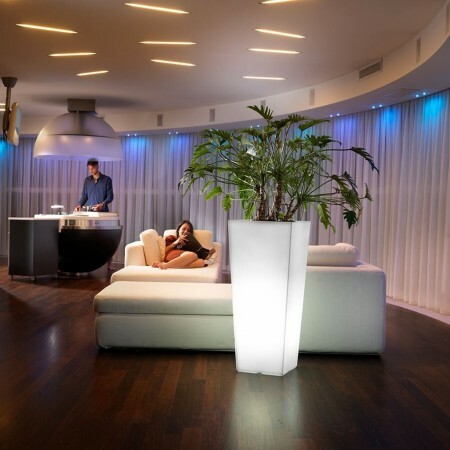 The lamp positioned at the base of the vase, distributes uniformly the light within the same, creating a unique atmosphere and welcoming. With modern design and with essential lines and clean, the chachepot Genesis square high with light, is a product of high quality construction. Recall that this article is also available in the round variant or in the colored version without light. Article visible below in related products.